Plan Check celebrated their first year in business last week, and after tasting several of their dishes, it looks like they will be around for many years to come. The table seated next to me lived in the neighborhood and as regulars, they insisted that I try the sweet potato fries with peach ketchup, and after one bite, I was glad that they were seated next to me. These were the best sweet potato fries I have ever eaten! A perfectly crispy exterior with soft centers and perfect salt, they were good by themselves, but a dip in the peach ketchup made this a hot, sweet, salty, tangy combination that was addictive. Available for only $6 a plate, this is an affordable addiction. The exotic vegetable chips were the fresh version of the chips you can buy in a bag at the supermarket, but just as fresh popcorn tastes completely different from bagged, these were an elevated snack which came with an avocado dip. This was also $6 and a great crunchy munch. The fries come fried in beef tallow (yes, beef fat), but you can opt for vegetable if you prefer. I did opt for the vegetable oil with my sweet potato fries, but for the regular fries my friend wanted the full beef fat flavor. They came with freshly made ketchup and smoked salt. She liked them, but loved my sweet potato fries. The neighboring table had ordered the Caesar Kale salad and it looked so good I had to get one. For $8, this was a great light meal combining two of my favorite flavors, and I was glad to find a pronounced garlic taste in the Caesar dressing. The dish that made me come to try this place was the fried jidori chicken thighs with sweet potato jam, smoked milk gravy and pickled okra for $13. It is a greasy, creamy, sweet combo which was not at all my preference for fried chicken, but I can see how it would appeal to those who like their fried foods with a sweet and creamy accompaniment. My favorite part of the dish was the pickled okra because it cut through all the grease. The chicken was very moist and had a nice flavor but as Roux said in “Chocolat” to the various chocolates offered, “Not my favorite”. The freshly made crullers with freshly whipped cream and sliced bananas ended the meal on a wonderfully sweet note for $6. If you love churros, imagine 3 huge round cinnamon sugar churros on a pile of cream. These crullers were actually the reason I tasted the sweet potato fries because I swapped with the neighboring table since there is no way to eat more than one unless you either eat nothing else or have a huge capacity for sweets! Since one of the partners of Plan Check created Umami Burger, there are of course numerous burgers on the menu ranging from the pastrami burger with swiss cheese, kimchi mustard, pickles and sunny side up fried egg, to the blueprint burger with smoked blue cheese, pig candy, fried onions, roasted garlic steak sauce, and peppercress. All burgers are less than $13, and beers, wines and whiskeys range from $6-$50 a glass. Before you leave, you may want to get a chip & PIN credit card (I got one from Bank of America) because many places like train stations and gas stations will not accept a US credit card for payment without a chip. If you are carrying enough cash to cover most transactions and want to only use a credit card for bigger purchases, then get a credit card which doesn’t charge foreign transaction fees before you leave. The fees could amount to 3% OVER the purchase price! Make sure your cards (and passport) are always carried in an RFID safe wallet or simply wrap some foil around them. Before you can use any of the SIM card options, you must have an unlocked phone, so either go to your cell provider and have them unlock it or buy/borrow an unlocked phone for travel. For cell phones and data, there are two providers of international phones/SIM cards/data plans which I would recommend if traveling to France (or several other countries). Le French Mobile was created in UK for students studying in France so their rates are substantially lower (starting at 20 Euros) than regular retail and their entire website is in English (recommended for longer stays). For most tourists from the US, Telestial has higher rates (about $50 USD) but easy options. If you are able or willing to translate the website info, the local French provider SFR has options for calls, texts, and data on prepaid plans and Simyo has deeply discounted rates (although I can’t vouch for their service). Since many people are taking their phones and tablets/laptops with them, it’s helpful to have some applications installed in case they get stolen. I recently received a Nexus 7 for Christmas from the generous @John8600 and installed AVG which protects against viruses and theft for free on Android devices. If you have an iPad or iPhone, and plan on taking it with you on a trip, you might want to install an application like gadgettrak.com for $19.95 a year (for phones) or lojackforlaptops.com $19.99 year (for laptops). It gave me peace of mind to know I could remotely lock, erase, track my device, and give the location of my stolen device to local law enforcement! After trying Muddy Leek during Dine LA last week, I went back with a friend for lunch today. The house salad with arugula, baby beets, pistachios, and goat cheese is a fresh way to start your meal for $10. Today’s salad special was made with avocado, mandarin orange segments, radishes, candied almonds, and arugula with a citrus dressing. No matter which salad you prefer, each is made with farm fresh produce and prepared with a light dressing which enhances the ingredients instead of masking or drowning them. 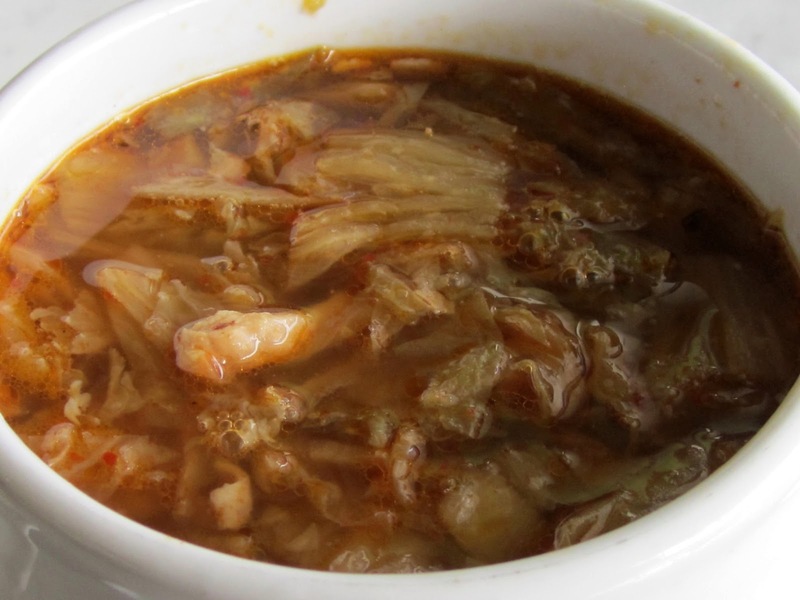 The special soup was chicken with a fermented cabbage (think of a mild version of kimchee). It’s a wonderfully hearty dish and I could have easily made this my meal. If you like hot & sour soup, you would probably enjoy this milder version made with chicken thigh meat. They also had a turnip puree and a sweet potato rosemary soup if you prefer other more vegetable based soups for $5. 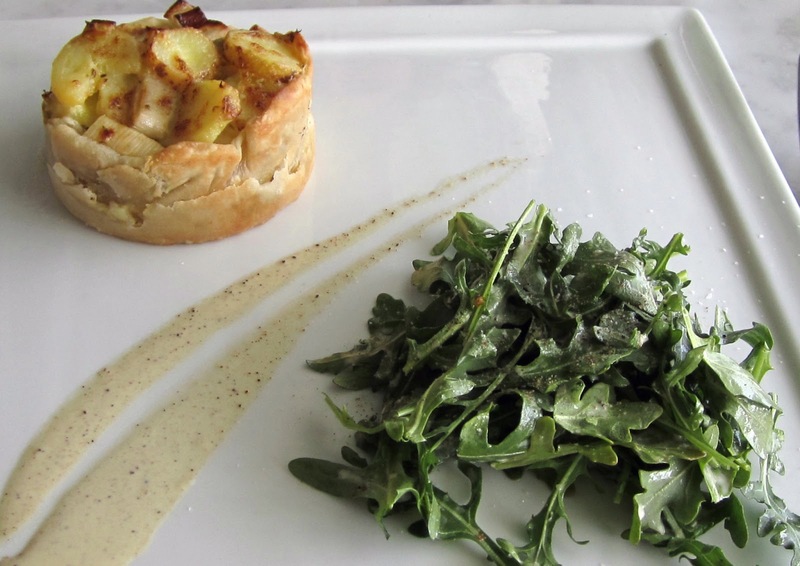 I chose the leek and potato tart for $12 which came with a nicely dressed arugula salad. The tart needed some salt, and the crust was a bit underdone, but overall it was a pleasant vegetarian dish. 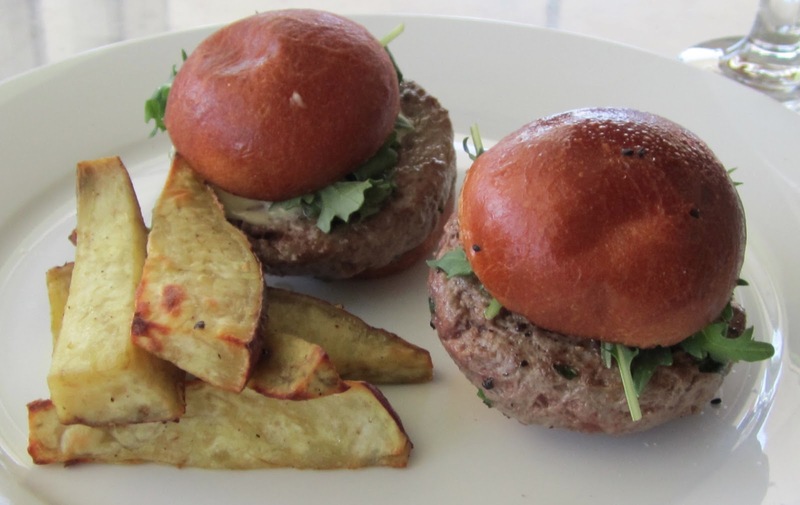 The hit of the meal was the grass fed sliders with wasabi aioli on brioche mini buns and sweet potato fries for $14. We asked for extra rare and got it 🙂 The excellent buns with just the right amount of aioli to slider ratio made this the perfect small bite (two 4 oz sliders). Sweet potato fries were a nice creative variation on the standard fries that accompany burgers. The warm chocolate cake with freshly made whipped cream for $7 was such a delight that I actually ate more than one spoonful! 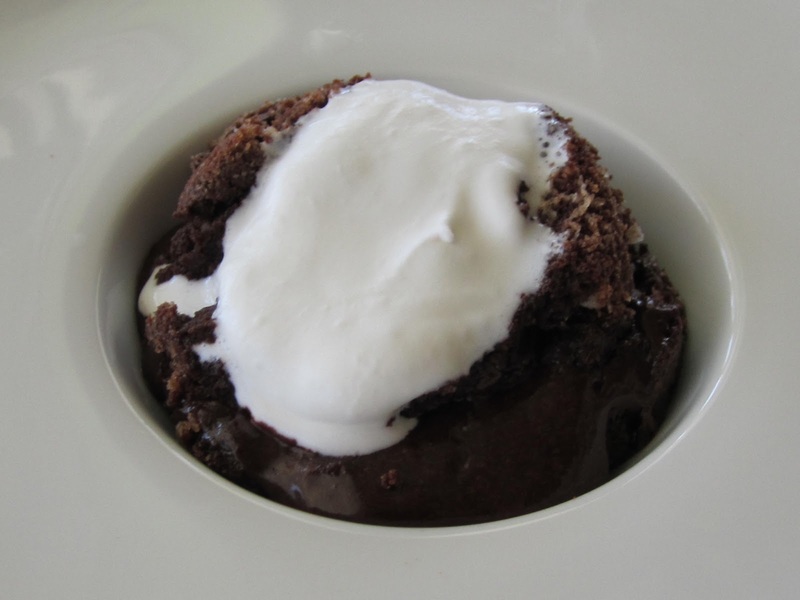 The consistency of the warm cake with chocolate sauce and freshly whipped cream made this about as close to perfection as I have eaten in a chocolate dessert. Not too sweet and not too rich, but sweet and rich enough to satisfy a dessert lover (my friend the former pastry chef)! The decor is modern with music by Nina Simone, and outdoor seating on warmer days makes this a perfect spot for a lazy afternoon, especially if you can stop by for happy hour between 4-6pm when they serve bites like pizzettes and merguez “hot dogs”. Eating in a place which embraces local organic and sustainable ingredients with servers like Sergio providing the paradigm of excellent service makes Muddy Leek a wonderful stop next time you’re shopping at nearby Surfas for that must have gourmet spice or gadget. 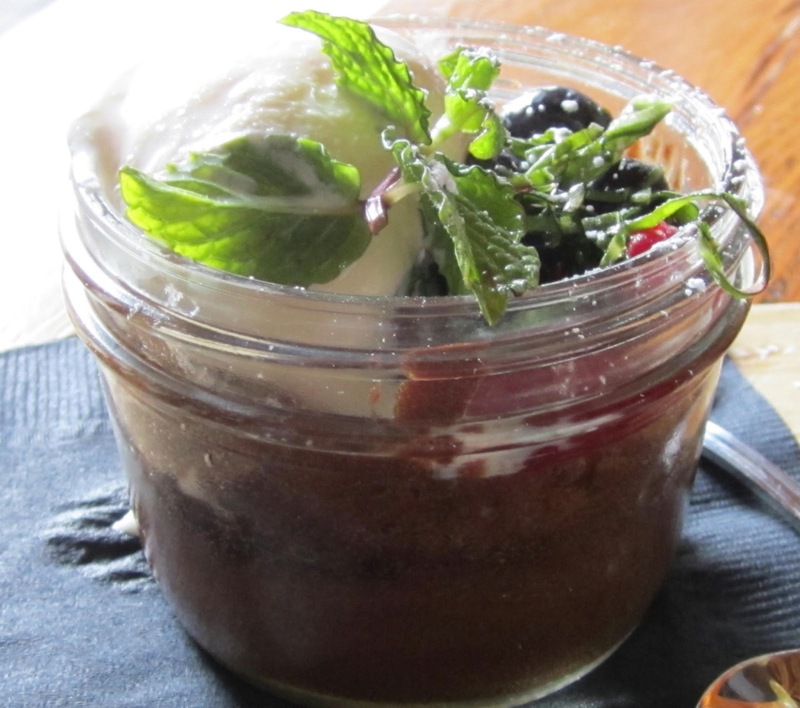 Trying new places is one of the most fun aspects of DineLA. Even though the location has housed other places, Brick + Mortar has moved in and completely renovated both the interior and the menu. The new tenant is a welcome addition to the neighborhood with fresh and creative brunch, lunch, happy hour, dinner, and late night dishes. If you can’t decided what to order, you can get the chicken and waffles, with a slightly spicy fried chicken breast and honey butter for $14. This was a substantial plate (about 12″ long), but so perfectly done that my friend finished every bite with a huge grin. The combination of crunchy, spicy, sweet and savory was a delight to the palate and the micro greens added a nice visual appeal to the plate. The next table saw the dish on our table and said, “We’re getting that next time”! 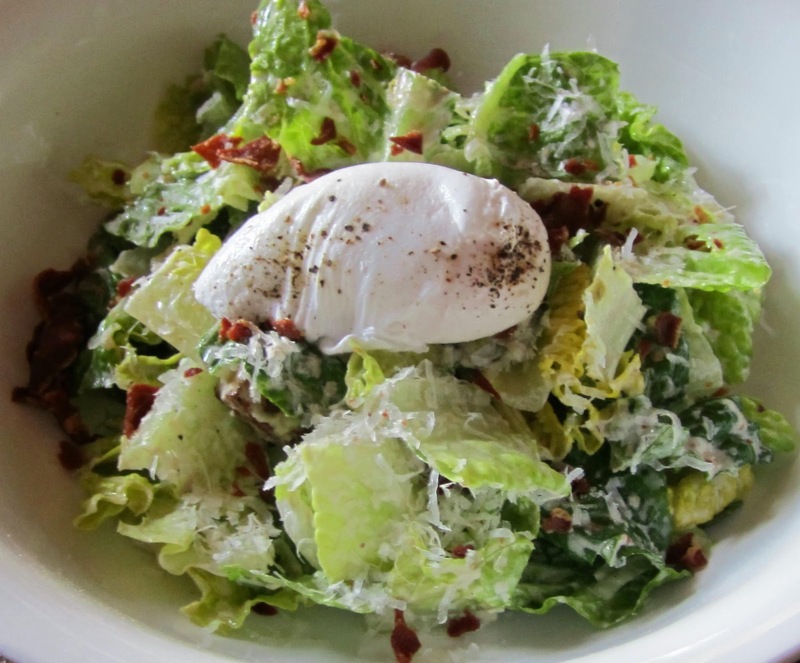 I was more in the mood for lunch so I tried the Caesar salad with poached egg and crispy prosciutto for $8. It was a decent version of the classic and the poached egg was perfectly medium. I would have preferred more garlic and more anchovy in the dressing, but I loved the crispy prosciutto bits. This is probably the closest thing to a “breakfast” salad I’ve ever had! 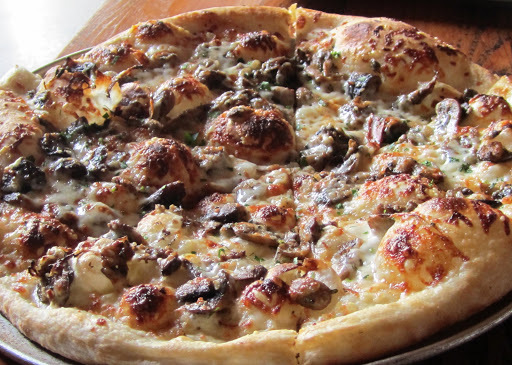 To go with my salad, I ordered the wild mushroom pizza with gruyere, shallots, truffle oil, and parsley for $15. The toppings were great, but I found the crust more of a flatbread crisp than a pizza dough. If you like flatbread pizzas, you would like the pizza here, if you’re looking for a pizza, I would go across the street to Bravo. Like the waffles and chicken, this was a large portion (about 15″ diameter), so after three slices I had the rest wrapped to go (yes, it was good enough to take the rest home). After polishing off her chicken and waffles, my friend ordered the chocolate lava cake for $8 which she demolished with a smile. With a Happy Hour from 4-7 week days and a late night menu (they stay open until 1 AM), you can come for a snack of cheese and charcuterie, or bigger bites like burgers or mussels any time. This place will surely be packed during the Super Bowl, so go early if you are planning to eat here this Sunday!